TEN MILES OF STEEL CABLES were used to haul the wrecked dredger Silurus into an upright position. The dredger, the most powerful of her time, broke from her moorings in a Scottish loch and was driven on to the shore at a point where it shelves steeply. The heavy tophamper of the Silurus, with her tower and dredges, caused her to heel over as the tide receded. Steel cables 6-in and 8½-in in circumference were used to haul her upright. NO engineer is called upon to move such heavy weights in one mass as is the marine salvage expert. Where the engineer may be faced with the problem of moving an engine part weighing anything from 50 to 150 tons, the salvage man has, in the course of his profession, to move masses weighing hundreds and thousands of tons. The engineer can choose his own time and place for moving his machinery, knowing full well that the load is well within the compass of the giant cranes which he proposes to use; but the salvage man is compelled to carry out mechanical engineering feats of a high order in any place that chance and the weather may have selected to sink a ship or throw her ashore. The spot is often in some remote corner that is difficult of access. The possible addition of foul weather makes the task of the salvage man far from enviable, and demands of him the genius to improvise with any materials that can be pressed into his service. The success of a salvage officer largely depends on his ability to meet these unusual conditions in unexpected ways. An outstanding instance of this was provided by the late Henry Ensor, of Queenstown (Cobh), Ireland, who was one of the most brilliant exponents of marine salvage. A red-bearded man of average height and slight build, he had a quiet voice and bore little resemblance to the popular conception of a man who had spent his days grappling with intricate salvage problems. Ensor gave an example of his resource in the salving of a new dredger named the Silurus. At the time of her construction she was the most powerful dredger built. She was designed specially for work in the port of Bombay, but while she was on the stocks the war of 1914-18 broke out. The conflict had been raging for eighteen months before she could be launched. At that time it would have been folly to attempt to tow her out to India, for she could do no more than crawl over the seas, and would have been an easy mark for a German submarine. In the circumstances it was decided to moor her in one of the Scottish lochs and leave her there until the war came to an end and it was possible to deliver her to the Bombay authorities. The loch was sheltered, with no possibility of a German submarine penetrating there, and no one anticipated any trouble concerning her. For about a year she rode quietly at anchor. Then a gale sprang up that whipped the waters of the loch into mountainous waves. The Silurus caught the full force of the wind, and the heeling and pitching loosened her anchors until the gale at last took complete charge of her and drove her hard ashore. In the ordinary way it might have been a simple matter to tow her off again. As ill luck would have it, however, she grounded at high tide, but, instead of going ashore where the bottom was flat, she took ground in a spot where the land shelved steeply into deep water. The shelving shore turned the mishap into a catastrophe. As the tide began to ebb, so the dredger began to heel until the falling water compelled her to turn right over. Once she started to go over, nothing could stop her. The weight of her tophamper - the bucket dredges and tower - rolled her over until they hit the bottom and prevented her from rolling any farther. 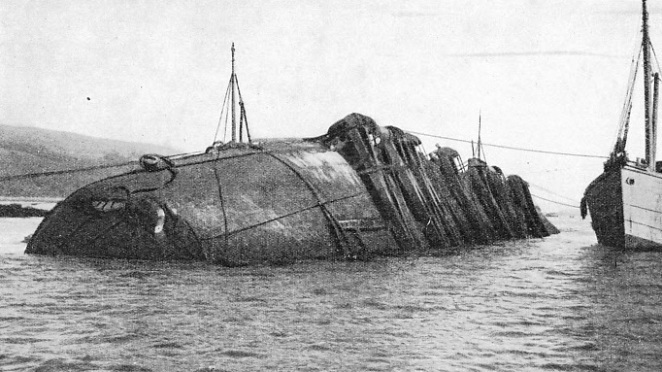 The Silurus lay with her funnel buried deep in the mud when Henry Ensor came on the scene. At the first glance he saw that her salvage would prove to be a difficult job, but this did not deter him. Having obtained the plans from the makers, Ensor went over the various compartments and calculated how much lift he could obtain by pumping compressed air into them. His figures revealed that he could rely upon compressed air to lift 1,000 tons of the weight of the ship, by blocking off some of the sunken compartments. This left him with the problem of lifting another 1,000 tons, or more. He determined to lift this weight with a series of pontoons, some of them to be attached to the side of the dredger, to the tower and to other parts of the structure where they would be most useful. In her overturned state the Silurus was hard to handle, as the weight of the tower greatly increased the problem of righting the ship. Ensor concluded that the best, if not the only way of bringing the Silurus to an even keel was to use the power of steam engines operating from the shore. He decided to obtain a sufficient number of steam engines to give him the power necessary to haul the ship upright by pulling on a series of steel cables attached to the sunken bulwarks of the dredger. It was a delicate operation that demanded careful planning. If cables had been attached in the ordinary way and one or two steam engines had been allowed to operate at full power, they would probably have pulled the dredger to pieces without shifting her. The upper side of her hull could not have been expected to stand the strain of the cables, which would undoubtedly have cut through and crumpled up the plates. 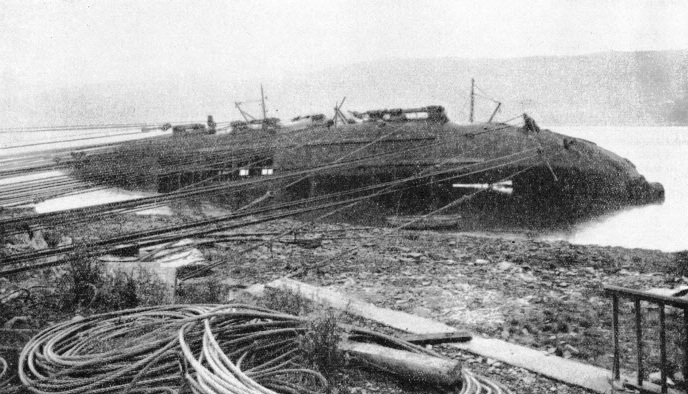 To avoid this danger it was necessary to strengthen the interior of the dredger with massive logs, 12-in and 14-in square, and to fix on the exposed part of the hull a strong frame of similar baulks of timber, which in their turn were protected from the cutting action of the cables by steel grooves over which the cables could run. At every point where the cables were to exert their pressure, the hull was protected from cutting and crumpling by this timber shield and the interior was strengthened with baulks of timber that ran from side to side on proper bearings to prevent any crushing of the ship. As the war was in progress, the Army and Navy had the first call on all materials and the salvors had to make shift with what they could get. Then from time to time the salvage men were called away to deal with some ship that was in urgent need of attention, which meant working on the Silurus when they could. In due course the divers went down with hacksaws and began to cut holes in the steel plates to allow the passage of some of the hauling cables. The rusting which had taken place inside the ship was another drawback, for directly the divers started to cut into the steel, the rust fogged the water and made it almost impossible for them to see. This slowed them down and increased the expense, but it did not prevent them from cutting the necessary holes. 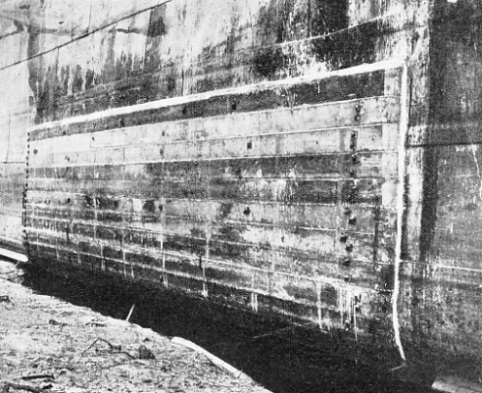 STRONG BAULKS OF TIMBER had to be fitted to the upturned hull of the Silurus to prevent the strain on the cables from causing the hull to collapse. The baulks themselves were fitted with steel grooves, over which the steel cables could run without cutting through the timber. When the ship had been strengthened by timbers inside and outside and the holes had been cut for the cables, Henry Ensor put into action the fourth stage of his plan. The Silurus was lying on the side of a submerged hill. She had fallen down the hill once, and Ensor was too good an engineer to run the risk of her falling down again. The divers were set to work cutting away the rising sea-bed between the ship and the shore, so that there would be a big level space on which she could come over easily without any danger of overturning. Before the divers could complete their task they had to level 1,000 square yards of the bottom of the loch. Meanwhile the hauling plant was assembled. For power Ensor relied on two steam engines, but, because of the inequalities in the land, it was not possible to set the engines up within sight of each other. Here was another factor that added to the risk of the enterprise, for when it came to hauling the ship upright, everything depended upon the strain being evenly distributed from end to end of the vessel. This entailed that both engines should haul in unison and that they should both start and stop at the same time. To get over this difficulty Henry Ensor worked out a code of signals by whistle. The crucial part of the programme was to find something ashore that would be able to withstand the whole weight of the dredger - over 2,000 tons - hanging on to it while the salvage squads were striving to pull her upright. Troubled by the dearth of materials due to the war, the salvage expert looked for something that might be made to serve his purpose, and obtained four disused boilers. Four big pits were then dug right down to the solid rock and the boilers were placed in the centres of the pits with their bottom edges on the rock. The boilers were then filled with concrete and the whole pit itself was rammed tight with concrete which knitted the boilers firmly to the rock and made them as one. A series of tests proved that the boilers, which were now four improvised bollards, were able to withstand a pull of 200 tons each, or 800 tons in all. Seeking something to stand the rest of the strain, he found an old propeller shaft which was 12-in in diameter. This was cut up into eighteen lengths to act as additional bollards, each of which was set in a bed of concrete, down to the rock. These were each found capable of withstanding a pull of 100 tons, so that the boiler bollards and propeller bollards could withstand a pull of 2,600 tons in all, which gave a fair margin when allowances were made for the water inside the dredger, and for the lifting power of the pontoons and compressed air. For the purchases from the ship through the blocks to the bollards, steel ropes were used, some 6-in and others 8½-in. In all the salvage contractor assembled at that lonely spot ten miles of steel cables to carry out the task of righting the ship. While the cables were being reeved and made fast to the ship, the salvors strengthened and lashed the dredging tower and other top gear with wire ropes to prevent them from breaking away as the ship came up. Henry Ensor had too much at stake to leave anything to chance, for by this time his outgoings were over £50,000. Everything was calculated down to the minutest detail, even to the loss of efficiency due to the friction caused by hauling on the ropes. At one spot it was impossible to get a direct pull on the dredger, because of the way the shore banked up. To overcome this, the salvage squad cut a trench through which the set of ropes could run straight to the ship. THREE ELECTRIC PUMPS in the hold of the Westmoreland, a vessel which was torpedoed by a submarine during the war of 1914-18 and salved by Commander I. J. Kay. The working parts of an electric pump of this type are kept cool by water circulating through on its way to the surface. The motors are watertight. Directly all the preparations were complete, Henry Ensor gave the signal to start hauling. The steel ropes took up the strain, and the bollards stood fast, but the funnel of the Silurus was buried 10 feet deep in the mud, and it needed an effort to break it clear and start her moving. Once started, however, she came up gradually until the turning moment attained its maximum and the pontoons ceased to exert any lifting power at all. As the cables went on slowly hauling, the pontoons were lifted clear of the water and hung, a deadweight, on the dredger. Operations were stopped while the steel lashings were cut through with blow pipes to enable the pontoons to float free. Cables were readjusted and hauling continued. Every precaution was taken to ensure that each cable bore the proper amount of strain, for Ensor knew that if all the strain were suddenly thrown on one end of the ship his careful plan might miscarry. Nothing untoward happened, however, and he brought the Silurus safely to an even keel without causing her the slightest damage. Once she was on an even keel, it was a simple matter to pump her out and refloat her. It was merely a question of waiting for the tide to drop, then setting the pumps to work and waiting for the tide to do the rest. The main instruments by which the marine salvage officer can achieve his purpose are not many, although the ways in which they can be used are remarkably diverse. He needs a good knowledge of ships, engines, pumps and all the engineering adjuncts of his profession, knowing what they can do and what he can squeeze out of them in an emergency. He thinks in terms of buoyancy, puzzling out how many tons he can gain here and there to get his ship afloat. A skilled diver is as essential to the salvage officer as his right hand, for nothing can be done to a sunken or stranded ship until her condition has been surveyed. It is on the diver’s report that the salvage officer decides on his course of action. Generally he can don a diving dress himself and go down to see what is wrong. Since Augustus Siebe invented the enclosed form of flexible diving dress in 1837 there have been various improvements in valves and in the components out of which the dress is made. Moreover, the submarine telephone has been added to enable the diver on the sea-bed to converse with the salvage officer on the surface, but the form of the dress remains broadly as it was fixed by Siebe. In this type of dress the most skilled divers in the British Navy can now penetrate to 300 feet, but it is essential for them to follow most scrupulously the decompression tables and rules which regulate the rate at which they can ascend from this depth. Long and sustained work cannot often be carried on in the open sea at half this depth, although in 1896 and 1897 treasure was salved by a diver named Angel Erostarbe, who worked in the flexible dress at depths varying from 170 to 186 feet. Pumps are important instruments in marine salvage and they may be used in various sizes up to giant 12-in pumps that need a hauling line and two divers to shift the inlets under water. Probably the handiest size, from a salvage point of view, is 6-in or 81- in, but the 12-in pumps are invaluable in an emergency. Some of the steam pumps will run for days without stopping, and many a ship has been kept afloat on her pumps for a week or more while completing her journey to port. Nor must the importance of motor pumps be overlooked, for they play a big part in situations where it is impossible to obtain steam. There is also the electric pump, in which the working parts of the pump are completely submerged and kept from overheating by the water circulating through them as it is forced to the surface. Electric pumps are useful at depths beyond the reach of steam suction pumps. Until the early years of the twentieth century almost the only means of lifting a fully submerged ship was by carrying her weight between barges or hulks. No salvage expert would have attempted to raise a ship of any size that was completely covered by water to a depth of several feet at low tide, unless it were possible to build up a cofferdam from her decks to the surface to prevent the sea from washing in while the pumps were throwing water out of her. But during the last century the salvage officer often picked up small craft from the bottom by sweeping cables underneath her. THE DREDGER NEARLY RIGHTED. The weight of the Silurus was over 2,000 tons. To take the righting stress of this weight four disused boilers filled with concrete were sunk in a pit and used as improvised bollards. This was sufficient to withstand a pull of 800 tons. In addition, a 12-in propeller shaft was cut into eighteen lengths, each set in concrete, to act as additional bollards and take the rest of the stress. These cables were attached to lifting craft - old hulks or barges whose weight-carrying capacity was more than the deadweight of the ship on the sea-bed. 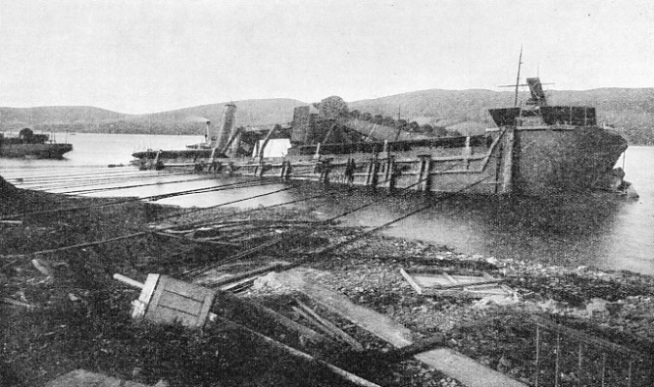 By making the cables between the wreck and the barges taut at low tide, the salvage officer was able to use the lift of the tide to raise the wreck off the bottom so that he could tow it into shallower water and repeat the process until the wreck was beached and could be pumped out and refloated. 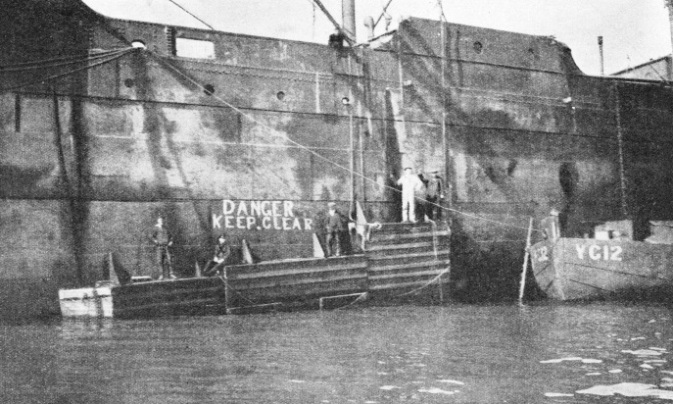 Commander G. Davis, when he salved the German submarine UC 44 off Waterford, Ireland, used hopper barges that were specially converted to lift vessels from the bottom. Their lifting capacity was 1,250 tons each. 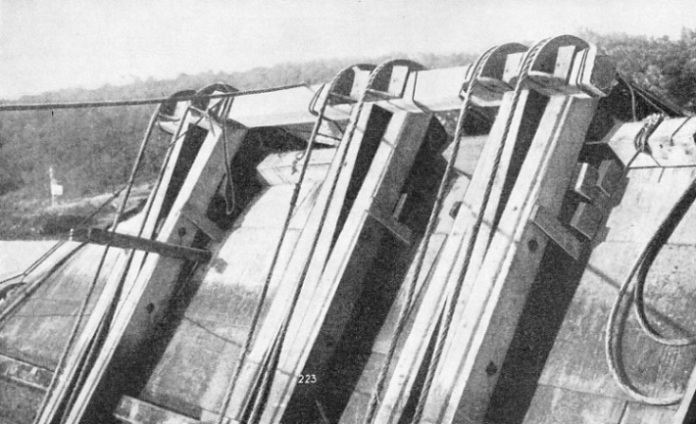 They were decked and fitted with tanks that could be flooded to decrease the freeboard of the barges by 4½ feet. With them it was possible to lift a ship where there was scarcely any tide, simply by flooding them and pumping them out when the cables were made fast to the wreck. The salvage of the UC 44 was a most dangerous operation, for she was full of unexploded mines, and there was a risk that a bump would explode a mine and blow the salvage squad to pieces. The feelings of the men when the submarine dropped out of the slings one day can be imagined, but luckily the mines failed to explode. More than one man in years gone by has tried to invent a metal diving dress that would enable men to reach greater depths, but it is only within recent years that any serious work could be done with such dresses. The Italian salvage concern known as Sorima used a German metal diving dress in which the arms and legs had movable joints; the ends of the arms were fitted with mechanical grips by which ropes and other things could be manipulated. With this dress the Italians were able to work daily in 53 fathoms, or 318 feet, off Rapallo, in the Mediterranean, and in four years they cleared all the cargo from the wreck of the Washington. It amounted to about 7,000 tons of metal - railway wheels, locomotive boilers and hundreds of tons of copper. Up to that time the submarine engineer would have regarded such a feat as impossible. In their fight to recover the gold from the wreck of the P. & O. liner Egypt off Cape Finisterre, in north-west Spain, the Italian experts used a metal diving cylinder tested to withstand the pressure of water at a depth of 900 feet. It was impossible for the man inside this observation chamber to do any work. He merely acted as the eyes of the men in the salvage ship above and directed them where, when and how to lower their grabs and explosives. Cylinders of oxygen enabled him to breathe at ordinary air pressure, so that he was able to remain below for hours without running the risk of contracting compressed air sickness, or bends, a danger which the diver in the flexible dress is compelled to run through breathing compressed air, which charges his blood with abnormal quantities of nitrogen. Some clever products of the engineer and inventor in the way of grabs of various forms for different situations enabled the Italians to recover over £1,000,000 in gold from the Egypt. Submersible pontoons, cylinders or camels, as they are sometimes termed, serve a somewhat similar purpose as lifting craft. When the salvage engineer needs something to lift a hundred tons or so of deadweight at a particular part of a ship, he may rely upon pontoons to raise this load for him. The load which a pontoon can lift varies with its capacity, and exceptionally large ones may be built to lift a load of 350 tons. Such cylinders, however, are not easy to handle, because of their size, and pontoons capable of lifting eighty or a hundred tons are handier. STEEL ROPES which lifted the Silurus were rove through enormous blocks. The task of salving this overturned dredger cost over £50,000, and demanded great engineering skill. To ensure that the Silurus would not fall down the submerged hill on which she was lying, divers levelled 1,000 square yards of the shelving bottom of the loch. The pontoons are floated alongside the wreck and made fast as low down as possible after having been flooded. As a rule the pontoons are made in several watertight compartments, each of which can be flooded or emptied separately to ensure better control. The lifting power is used by forcing the water out of the compartments with compressed air. The outstanding development in marine salvage is the use of compressed air. With it the modern salvage officer has accomplished some of his most remarkable feats and made his greatest advances in salvage practice. A bubble of air released under water rushes instantly to the surface, thus obeying a natural law. Times without number salvage men have watched the bubbles of air ascending to the surface from the diver’s helmet, yet it did not occur to them that those bubbles of air which made their way to the surface gave them the power to lift the heaviest ships from the bottom. One or two experts, having found that they could rid a pontoon of water as easily by forcing compressed air into it as by pumping the water out of it, began to experiment. A ship that had grounded in the Scillies was successfully refloated by compressed air before the war of 1914-18. It was during that war that the possibilities of compressed air began to be generally appreciated. There was the gravest concern at the Admiralty when the battleship Britannia was thrown hard ashore on the island of Inchkeith in the Firth of Forth one dark night. The naval authorities found it impossible to move her with engines full astern; so they brought tugs and torpedo boats out to her as quickly as possible and did their best to tow her off. Their efforts failed. Without delay the men were pressed into the service of discharging her stores into lighters And ships alongside, all her shells and ammunition were unloaded and then the bunkers were cleared of coals. Still the naval authorities failed to lighten her sufficiently. She remained hard and fast. Her position resembled that of the warship Montagu, which ran ashore on Lundy Island, in the Bristol Channel, during a fog in pre-war years. There appeared to be no difficulty in getting the Montagu off. But the engineering problem of moving a mass of steel weighing thousands of tons from the Shutter Rock was more than the naval authorities could solve. They stripped the Montagu of everything movable, took out her stores and shells and even her guns, but they could not move her. At last, after having spent £85,000 on the task, they were forced to give it up as hopeless, and a ship-breaker bought for £4,250 the wreck of a vessel that had cost £1,000,000. The same engineering problem confronted the naval authorities at Inchkeith. They lightened the Britannia as much as possible in the hope of towing her off. The most powerful cranes, even if they could have been brought to the spot, would not have availed. Lifting lighters and pontoons alike were useless, for the ship seemed to be welded to the rocks. At this juncture, when she was being given up as a loss, the decision was made by the late Sir F. Young to try to lift her off the rocks by compressed air. The rocks had cut right through her bottom and penetrated so far that they had fractured the plates in her double bottom. Through these fractures the sea had rushed and flooded the engine-room. An examination revealed the fractured plates in the bottom of the engine-room, but throughout the rest of the ship the false bottom was watertight. It was therefore hoped that if the fractures in the bottom plates of the engine-room could be stopped, it might be possible to lift the battleship off the rocks by pumping a belt of compressed air into the double bottom. Wooden moulds were made and fitted by divers over the fractured plates in the engine-room. These were then filled with a special cement which hardened rapidly under water. Directly this had been done, the engine-room was pumped out and the fitters were able to work at speed drilling holes in the false bottom to take the air connexions which had to be made specially. When these had been completed the air compressors were set to work pumping air into her. THE STANDARD PATCH applied to many vessels torpedoed during the war of 1914-18 was first successfully used in the P. &. O. liner Berrima in 1917. A template was cut out to fit the lines of the ship and a timber patchg was cut out to fit the lines of the ship and a timber patch was made from it. This was bolted into position and the joints made watertight. Obeying the natural law, this air sought to get to the surface of the sea, and was brought up against the underside of the false bottom. Lacking holes through which it could escape, it formed a belt of air which increased in depth as pumping went on. As the double bottom had previously been full of water, and there was now a belt of air where there had been water, it was clear that for every inch in depth that the belt of air was increased, an equivalent quantity of water was forced out of the holes at the bottom by the pressure of the air. A simple demonstration of how air will keep water out of a vessel may easily be made. It is only necessary to take an empty bottle and immerse it slowly in an upside-down position in a bath or pail of water. Although the bottle may be completely submerged, the experimenter will find it impossible to fill the bottle completely with water so long as it is held perpendicularly. There will always be a belt of air that is compressed upwards by the water. If one end of a long rubber tube is introduced through the neck of the bottle into the air belt, and the other end is attached to a cycle pump, it becomes a simple matter to pump in more air until the bottle is cleared of water. This can be accomplished because the bottle remains airtight, and if similar airtight conditions can be created in a wrecked ship, the same results can be achieved. The salvage authorities were driven by the condition of the Britannia to make their great experiment, and eventually they lifted the battleship off the rocks on a cushion of compressed air, for she was given enough buoyancy to enable the tugs to tow her away to dry dock. The sinking of the £4,000,000 Italian battleship Leonardo da Vinci in Taranto Harbour, Italy, on August 2, 1916, brought about a full realization of the miracles that could be accomplished by using compressed air to raise sunken ships. She was a battleship of 24,000 tons, and no ship of this weight had ever been raised before from the sea-bed. Her weight, sitting on her funnels and turrets, had driven them down into the stiff clay which gripped her securely, so that there was the question of releasing her. Then there was the problem of refloating her. Assuming it were possible to release her from the clay and refloat her, the efforts would be vain unless she could be righted. No upside-down battleship in the history of the world had ever before been turned right side up again. The Italian Government regarded it as a question of national prestige that the battleship should be raised. After one or two schemes had been considered, General Ferrati worked out a plan to raise the ship by compressed air. It was an engineering feat of the first magnitude, the greatest undertaken up to that time in marine salvage. Major Gianelli, a skilled engineer, took charge of the operations, which began early in 1917, and he saw them through to success. compartment. Patches were made to fit over the holes caused by the explosion which had sunk her. A special channel a mile and a half long was dredged to the dry dock, which had been prepared with a timber framework to support her. In September 1919 she was floated on compressed air and towed to dock. The turrets and funnels were severed from inside the ship and left embedded in the clay, to be lifted later. By January 1921 repairs had been effected, and she was towed out into the bay to be righted. About 400 tons of ballast were loaded into her and arrangements were made for pumping 7,500 tons of water into certain compartments on the starboard side above the centre of gravity, so that she would become top-heavy and swing right over. She began to turn when 800 tons of water had been introduced, and eventually swung over and came to rest right side up with a slight list. THE UPTURNED HULL of the dredger Silurus was strengthened by massive baulks of timber, shown in greater detail in another picture on this page. The weight of the submerged dredger’s tower made the problem of righting her most difficult, particularly as the tower was buried in mud. Since then a number of big German warships ranging up to 28,000 tons have been raised by compressed air at Scapa Flow. The salvors worked in depths down to 126 feet, a fact which caused the men in the ship to toil in an air pressure of 35 lb to the square inch. The most stringent rules were instituted to see that the men did not come out of the ship too quickly, and decompression chambers were available for those who suffered from compressed air sickness. All these big overturned ships were raised on the same general plans. An air-lock was first attached to the bottom, entry was effected by oxy-acetylene or other cutters, and compressed air was introduced into a compartment to force the water level down inside and enable the men to stop all apertures and make bulkheads tight. The ships were divided into a number of compartments, each with its own air-locks and separate air supply. The main engineering problem was to balance each wreck. This was not easy, because of the way in which the weights were distributed inside the ship. The position of the engines made the stern heavier than the bow, so that the bow had a tendency to rise first, and if it came up at an acute angle it would spill from the underside of the ship two or three million feet of compressed air from the other compartments. The division of the ship into separate compartments enabled air at varying pressures to be pumped into different parts of the ship. The greater the weight to be lifted at a certain part of the ship, the greater was the pressure of the air. The necessary pressure factors were all worked out beforehand, and comprehensive tests were made on completion of the work to ensure that the air in each compartment was sufficient to raise its load and bring the wreck to the surface in a properly balanced condition. These operations at Scapa Flow were outstanding examples of submarine engineering. Commander G. J. Wheeler was confronted with a difficult task when ordered by the Admiralty to salve the German submarine UB 110, which had been sunk by the depth charges of motor launches and destroyers on July 19, 1917, five miles off Saltburn, Yorkshire. She lay at a depth of 27 fathoms, or 162 feet, at low water. Divers were able to recover important documents, but the Admiralty was anxious to lift the submarine to study her technical developments and the magnetic torpedo. 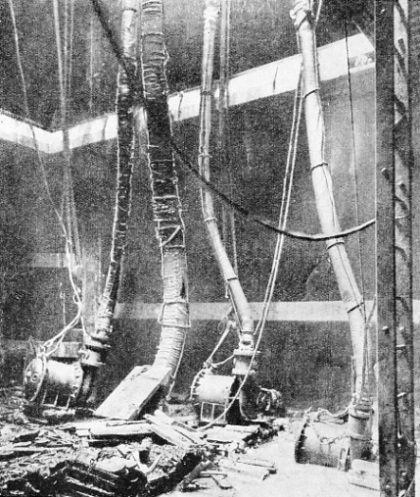 As speed was essential, Commander Wheeler got his cables in place underneath UB 110 and slowly wound her up to the surface by steam power. The weight of the submarine hanging in the cradle of cables was about 980 tons. This was the greatest weight raised by this or any other means from such a depth. Having raised the vessel, the salvage officer took her forty miles to the mouth of the Tyne to dock her at Jarrow, but unluckily she slipped out of the slings at the mouth of the river while waiting for high water and hit the bottom. Everyone in the salvage waited for the mines to explode. As nothing happened, they got her back quickly into the slings and carried her to port. 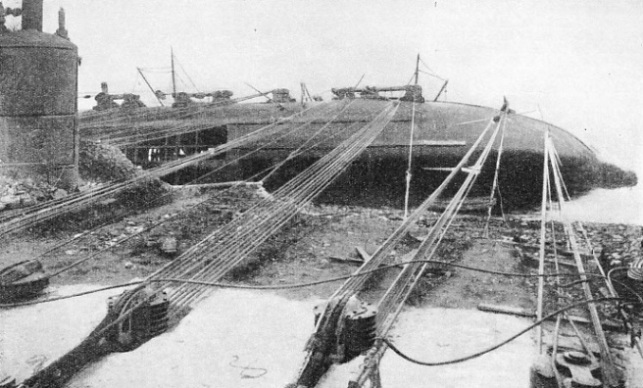 A BANKED-UP SHORE made it necessary in one place for a trench to be cut so that the steel cables used to haul the Silurus into an upright position could get a direct pull on the vessel. 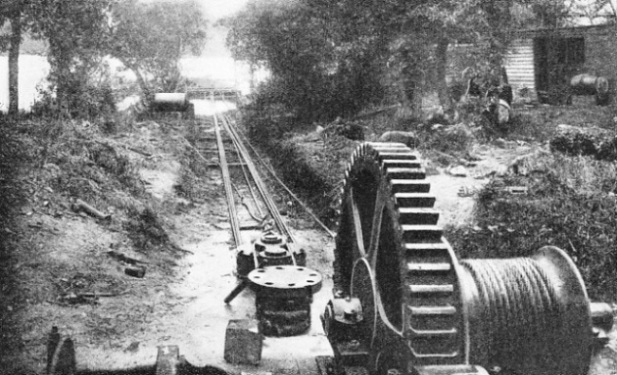 Power for the hauling operations was obtained from two stationary steam engines. It was Commander G. J. Wheeler who, in a moment of urgency in March and April 1917, had templates cut for the sides of the torpedoed P. & O. liner Berrima, and instructed the shipwrights obtained from Devonport dockyard to make a big wooden patch to cover the hole. The dimensions were so large that he had the patch made in three sections, each of which weighed 14 tons when finished. These massive sections were taken out to the Berrima and it was necessary to weight each section with 13 tons of ballast to sink it into place so that it could be manipulated home by the divers. The templates were made so accurately to the contour of the vessel that the sections fitted perfectly and the salvage officer was able to pump out and float the ship the same day as the last section had been fitted. It was unnecessary to use any large pumps during the journey up the harbour at Portland. The Berrima was loaded with 12,000 tons of Australian produce, beef, mutton, wheat, rabbits and eggs in pulp. The enemy torpedo had struck the refrigerated hold, blowing the cargo of meat to pieces and making it impossible for the divers to work in the hold. This difficulty led Commander Wheeler to improvise the patch. The wooden patch fitted to the Berrima in April 1917 was the progenitor of the so-called “standard patch” which proved invaluable during the German submarine campaign. In many instances the salvage officer is grievously handicapped by lack of time. A ship steaming through the fog may have the misfortune to run ashore on an ebbing tide in such a position that a gale would spell her doom. A matter of hours may be vital, and many a salvage man has been faced with the alternative of hauling a ship off at the top of the next tide or losing her altogether. Such emergencies call forth all the skill and craft of the salvage man and he sometimes accomplishes unbelievable feats in the most unexpected ways. An excellent example was that of the Archangelos, which ran bows-on to the Cornish coast in April 1929. The salvage officer who hastened from the nearest port failed to shift her with the tugs. She was held tightly by the bows, with deep water under her stern, and in that position half a gale would have finished her. It was impossible to unload any of her cargo forward to lighten her. Removing the cargo aft would have made matters worse, as this would have caused the weight in her bows to sit more heavily on the rocks. In his dilemma the salvage officer realized that what he wanted was a gigantic counterpoise aft that would swing her bows up clear of the rocks. To load her with hundreds of tons of ballast would have taken time, and the weather was threatening. The officer turned to the sea to accomplish his object. He opened the seacocks in the stern holds, and allowed the water to flow in until it tilted up her bows clear of the rocks. Then he towed her off, pumped the water out of her flooded holds and took her to port. When the White Star liner Bardic ploughed on the rocks a mile from the Lizard Light, Cornwall, on the night of August 31, 1924, her chances seemed negligible. Commander I. J. Kay found the Bardic grinding heavily on the rocks. She had a most valuable cargo, including bales of wool worth £100,000 or more. Only her position on the rocks prevented her from going down. Commander Kay considered he had just a fighting chance. Having called for two motor engineers, six riggers, three 12-in motor pumps and a 6-in pump, he began a thrilling battle with the sea. On September 3, when the famous salvage ship Ranger had arrived, he salved £50,000 worth of wool. For the next three days the derricks were slinging cargo into the vessels alongside at full speed - bales of wool, hindquarters of beef, bags of wheat by the hundred. The value mounted by tens of thousands of pounds. On the next day the weather broke, and Kay wired for more pumps and men until he had six 12-in pumps with smaller pumps and two air compressors, as well as four engineers on the spot. His battery of pumps could deal with 1,160,000 gallons an hour. Once the salvage men had to be taken off the liner by lifeboat. The gales made the Bardic grind so badly that Commander Kay, knowing his only chance of saving her was to hold her still to prevent her from being torn to pieces by the rocks. Realizing that all the anchors in the world would be useless for his purpose, he adopted the bold expedient of completely flooding her aft. His plan of using the sea to cheat the sea of its prey was a brilliant success, for on September 28 he was able to control the water by his pumps and air compressors and tow her off by four tugs to Falmouth Harbour. Cornwall. THE WOODEN PATCH fitted to the P. & O. liner Berrima by Commander G. J. Wheeler in April 1917 was built in three sections, each weighing 14 tons. The patch was made to cover a hole caused by a torpedo, and a modification of this method was frequently applied to other torpedoed vessels after the success of this experiment. 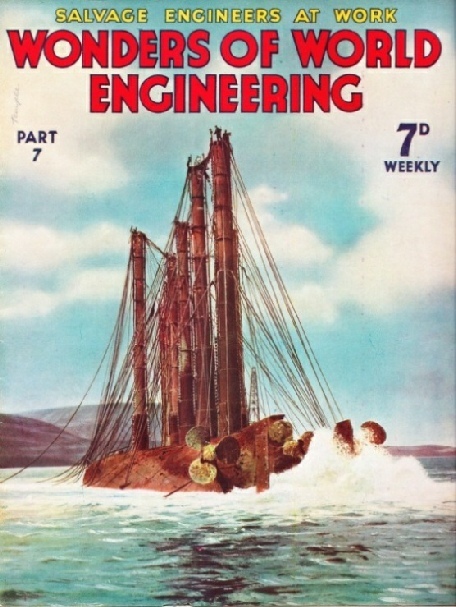 The cover of Part 7 shows the former German battleship Kaiserin after she had been raised by salvage engineers from Scapa Flow. The tall pipe-like structures are air-locks, through which air was introduced into the up-turned hull of the sunken warship.